By MrSydasien in NSAN NÈWS on 25 March, 2019 . During the period 5-12 May 2017, the NSAN editor Lars Eklund visited Bhutan on invitation from the Royal University of Bhutan (RUB) and more specifically by its College of Education in Samtse (SCE). The planning for the visit originated in Lars meeting Swedish musicologist Johan Westman working at the Lu-Rig Centre for Music Education and Research. Samtse College of Education is one of eight Bhutanese colleges at different locations in the country, under the umbrella of RUB. It was established already in 1968 as the Teachers Training Institute. 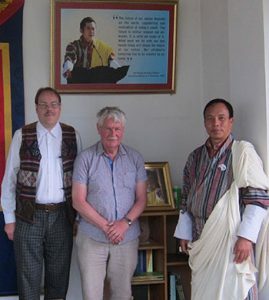 Johan Westman and Lars Eklund meeting Nidup Dorji, RUB Vice Chancellor. 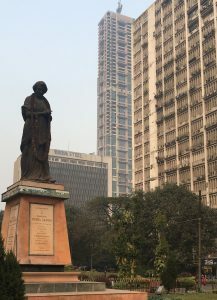 Currently SCE has external linkages with a number of European, American and Australian universities, including TERI University in Delhi and Aalborg University in Denmark, but till now no Swedish universities, and that became the main purpose of Lars’ visit to broker more connections. Lars was invited to hold a seminar (photo above) for the faculty and students on important research fields common to Sweden and Bhutan, presenting information about Nordic PhD theses and Swedish research projects related to Bhutan – mostly within natural and agricultural sciences, and providing concrete suggestions regarding specific Swedish university institutions in the fields of social science and humanities that might be of interest for SCE. During his stay in Samtse he also held separate meetings with the professor at the different centres, and with the SCE President, Dr. Dorji Thinley. These meetings were fruitful and immediately a connection was made between the Dept. of Mathematics at SCE and a Matematics department at a Swedish university. On his final day in Bhutan, in the capital Thimphu, Lars had a 45 minutes meeting with the Vice Chancellor of Royal University of Bhutan, Nidup Dorji. Read Lars complete report from the Bhutan visit.